Every day, we step over a world of life hidden in the soil beneath us. In this module, we will investigate the question “What living components can we find in our schoolyard soil?” Before we begin, it may be useful to review the basic definition of soil. Figure 3.1: In this photo from the NOAA Photo Library, a dust storm approaches Stratford, Texas during the Dust Bowl of America’s Great Plains in the 1930′s. 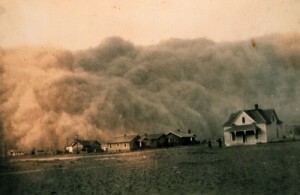 The loss of topsoil devestated the region. You might wonder what exactly soil and dirt are, and what differences (if any!) there are between them. While dirt can refer to soil, in reality soil is more than “just dirt”, and soil is defined in very specific ways. Take a look at this short website, “What is Soil?“, from the Smithsonian. Soil is the place, the time, the ecosystem, as well as the dirt and its components. Over most of the Earth’s land lies a thin layer of soil—a complex and variable mixture of minerals, air, water, decaying remains of life, and countless living organisms. The Earth’s “skin” is not one soil, but many soils—each with its own story. Tens of thousands of different soils cover the continents. Soils are alive. They are born, they age, they breathe. Soils are constantly created and lost. Soils are everywhere in our everyday lives. Living soils sustain life on Earth. And soils are constantly changing, making soil science a dynamic field of study. 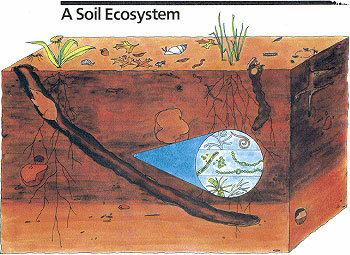 Figure 3.2: Soil ecosystems support a wide variety of life, both macro- and microscopic. There are macro- (visible to the naked eye) and micro- (too small to see without a microscope) components in the soil. There are living things in the soil, as well as dead and decaying organisms, all part of the broader soil ecosystem which in turn sustains other life on Earth. Click here to view or download 10 Key Messages as a pdf file. Click here to view or download 10 Key Messages as a PowerPoint file.